Oh my goodness, my little ones had a BLAST playing this game today in math! We just started our subtracting within 10 unit, and I was looking for some new additions to our math centers. 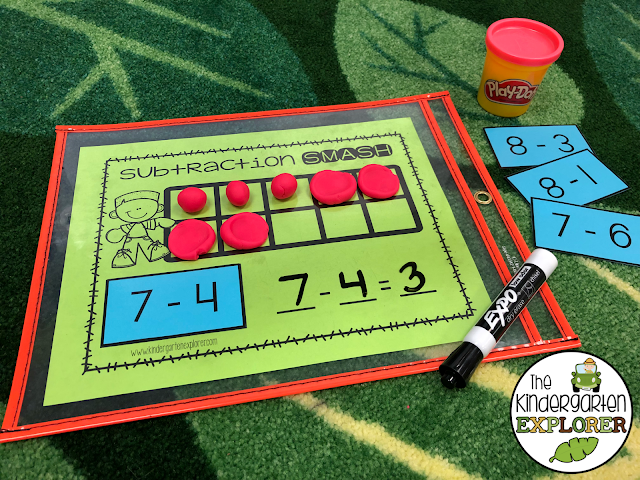 This hands-on subtraction game was just what we needed... and, duh, PLAY-DOH! Click the picture to download this FREEBIE! All subtraction facts within 10 are included in this fun little game. I put the pages in sheet protectors, and laminated the subtraction fact cards. All your students have to do is pick a card, make play-doh balls, and SMASH! It was SO much fun, and an excellent way to introduce and reinforce early subtraction skills. You can find it on my Freebie Tab... Enjoy!